Polish Mining and Gas Extraction Company (PGNiG), a state-controlled oil and gas company, and Grupa Lotos S.A, a vertically integrated oil company also based in Poland, have conducted two commercial bunkerings of liquefied natural gas (LNG) this month. These are the first operations of this kind carried out at seaports in Gdańsk and Gdynia. Having completed the two LNG bunkerings between 13th and 18th of March, the companies say they will continue their cooperation in this area, thereby strengthening the competitiveness of Polish ports and popularizing LNG as an ecological fuel for Baltic Sea shipping. 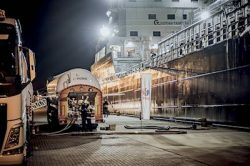 “Bunkering of ships with natural gas in liquefied form is another of many possibilities of using gas, which PGNiG imports to Poland from Qatar, Norway and the USA through the President Lech Kaczyński LNG Terminal in Świnoujście. We are convinced that this fuel, due to its ecological values among others, is the future of maritime transport in the Baltic Sea,” commented Maciej Woźniak, Vice-President of the PGNiG Management Board for Trade. “Lotos wants to become a leader in the implementation of new generation alternative fuels and LNG is certainly one of them. It is ecological and safe fuel. The development of logistics and bunker infrastructure for LNG is the key to further increase its popularity. Therefore, we are involved in a feasibility study on the construction of a small scale LNG terminal in Gdańsk, which is co-financed from the European Union (CEF),” said Patryk Demski, Vice-President of the Management Board of Grupa Lotos for Investment and Innovation. “The cooperation of Grupa Lotos and PGNiG has been going on for many years. PGNiG is a natural gas supplier to Grupa Lotos and Grupa Lotos uses this fuel for refining of crude oil. Cooperation is very successful. Both companies take advantage of their experience – knowledge about the marine fuel market on one hand, and specifics of LNG on the other,” added Cezary Godziuk, President of the Management Board of Lotos Asfalt. On March 13th this year 54 tonnes of LNG fuel (32,000 Nm3 of gas) were injected into tanks of the vessel Fure Valo. The unit belongs to a Swedish shipowner who plans to further develop the LNG-powered fleet, extending it to six such vessels by the end of the year. The second bunkering took place on March 18th this year, when 18 tonnes of LNG fuel (10,800 Nm3) from single tanker truck were loaded into tanks of the vessel Ireland. “This is a milestone in the development of this market in Polish seaports, which will significantly increase their competitiveness. I would like to emphasize particularly the model cooperation in the bunkering of ships with both the Port of Gdańsk and the Port of Gdynia,” said Henryk Mucha, President of PGNiG Obrót Detaliczny Sp. z o.o. (PGNiG Retail Branch). By the end of 2025 at the latest, a sufficient number of LNG bunkering points should be created in seaports in line with an EU directive. In case of Poland, these are to be: Gdańsk, Gdynia, Szczecin and Świnoujście. From now on, the LNG bunkering service enters the permanent offer of both entities and can be provided in both Tri-City ports. “The interest in bunkering in Polish ports among shipowners is very high. 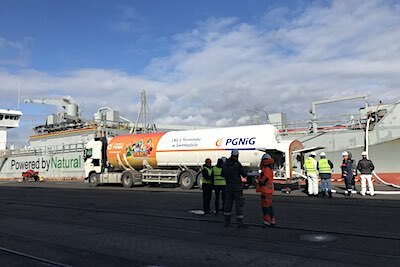 This is due to the growing awareness about LNG, an alternative marine fuel, which is the only mature solution that can meet current and future emission standards, with simultaneous economic viability,” said Marcin Szczudło, Vice-President of PGNiG Obrót Detaliczny responsible for the CNG / LNG area. LNG will be gaining popularity also due to the adoption of the so-called “sulphur directive”. The European Commission plans to completely eliminate emissions from maritime transport by 2050. For Central and Eastern Europe this means more stringent standards than in other parts of the world. The “sulphur directive” imposes on shipowners whose ships sail around the SECA area (Sulphur Emission Control Areas), including in the Baltic and the North Sea, the obligation to use fuels with a sulphur content not exceeding 0.1%.